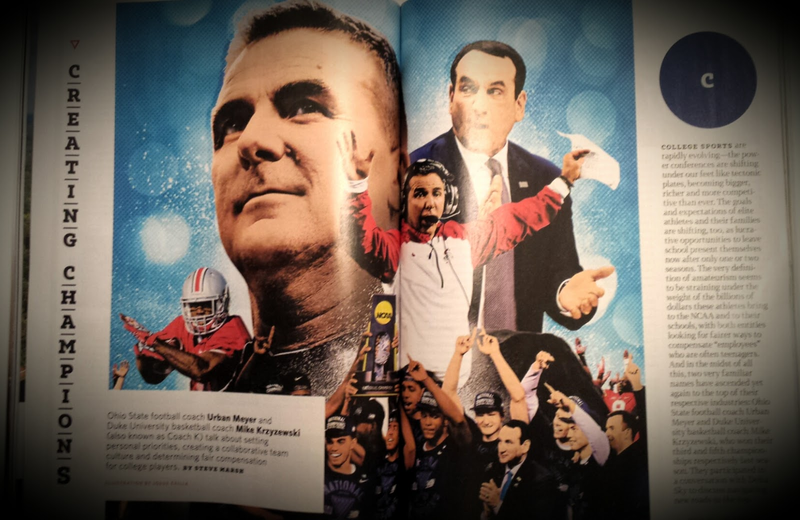 Feature article from Delta’s Sky magazine about Coach K and Coach Urban Meyer on creating champions — September 2015 issue. On my recent Delta flight, I read an interesting leadership article in Delta’s Sky magazine – the feature piece being an interview of two of the NCAA’s most successful coaches – Coach MikeKrzyzewski (Coach “K”) of Duke’s men’s basketball team and Coach Urban Meyer of Ohio State football with five and three national championships, respectively. Both coaches took leave of absences in their careers due to medical concerns. Their successes cultivated deeper motivations to win exacting significant physical, mental, social, and emotional tolls. After stepping away, however, each returned to coaching posts to continue winning ways, but implemented mechanisms and understanding to keep themselves in check. Take-away: To operate in peak form like their respective teams, leaders, too, need to ensure self-maintenance. The interviewer asked the coaches about social media’s effects on the players. Neither coach stop players from interacting on social media. They see social media as part of a change that did, does, and will continue to be a big part of players’ lives. Instead, the coaches focus on teaching their players how best to leverage social media and be wary of its potential to amplify. At Body Boss, we ran into many coaches who wanted nothing to do with social media. These same coaches were against technology in the weight room. However, the more progressive coaches saw social media and technology as tools to achieve goals not able to be realized before. Take-away: The only constant is change, and successful leaders find opportunities to leverage new tools and ways of thinking to achieve goals. There is a necessity to coach players beyond the field. It’s easy to focus on employees or colleagues as purely that – employees. However, like Coach K and Coach Meyer demonstrate, there is much more to be gained when coaching players beyond the field. In business, the importance is in developing capable, courageous, and influential people, not just workers. Take-away: There are greater ripple effects when influencing people beyond the job. Urban Meyer recalled the first time he saw Tim Tebow play; except, he wasn’t playing football. Instead, Tebow was playing right field in a baseball game. By the third inning, Meyer made up his mind to sign Tebow because he immediately saw his competitiveness and tenacity. Take-away: Finding High Potentials and “athletes” can be tough, but once found, you can slot them anywhere and know they’ll get the job done. Both coaches also reflected on the importance of players’ support systems. Given the many avenues for distractions for players, it’s important for the player to listen to their true support groups, not the noise. Take-away: There is a lot of noise today, but it’s up to the individual (player, entrepreneur, other) to choose who to listen to as it’s their lives, businesses at stake. Both coaches have won multiple championships in different schools. The key to sustained success is cultivating adaptive cultures. Coach K noted cultures change, but the foundation of the culture, the values, are what don’t change. Take-away: Values should sustain over time. They are the building blocks of cultures that do and should change. If you’ve read the article about the coaches, what were your take-aways? What points would you agree with them on? What points would you NOT agree with them?